The big one finally came to Blu-ray. 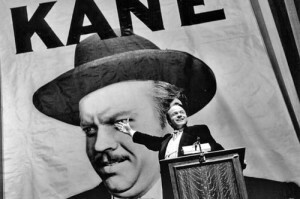 Warner Home Video’s Citizen Kane: 70th Anniversary Ultimate Collector’s Edition Blu-ray — the format’s debut of Orson Welles’ classic 1941 mystery-drama film — arrived on Sept. 13, 2011, for the list price of $64.99. The new edition contains all manner of audio and video extras, the documentary Battle over Citizen Kane and the 1999 HBO original film RKO 281, and a whole slew of collectible goodies, including a 48-page collector’s book, a 20-page reproduction of the original 1941 souvenir program, lobby cards, reproductions of rare production memos and correspondence. What’s most important, of course, is the quality of the feature film itself, and Warner aimed to issue the highest quality version of the film ever seen. “The work to recreate the original look of the film and to clean up the effects of aging was a painstaking, frame-by-frame process. The source for most of the picture was a 4K scan from a 1941 composite fine grain positive master.” says Warner Bros. Motion Picture Imaging (MPI) colorist Janet Wilson. Amazon has an additional set that includes the Citizen Kane Blu-ray plus a DVD edition of Welles’ second movie, The Magnificent Ambersons (1942), marking the film’s digital debut. Also on tap for the package is the 1999 HBO original film RKO 281, which stars Liev Schreiber as Orson Welles and details the making of Citizen Kane. That package will be priced at $79.89. Finally, a Citizen Kane: 70th Anniversary Ultimate Collector’s Edition DVD is listed, featuring lots of the bonuses features found on the Blu-ray. It retails for $49.92.